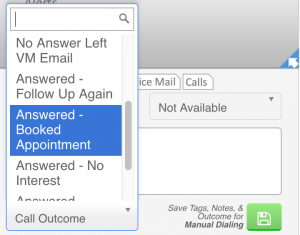 The turboDial Dialer panel includes a Call Outcome selector that can be used to designate the outcome of each call. You must configure the set of possible Call Outcomes according to the unique needs of your business. Full instructions for setting up your custom Call Outcomes is included in the video found in the Call Note Custom Fields guide.